With it’s large Garrett GTX CHRA matched to a newly designed Stainless Steel Exhaust Housing and Aluminium Anti-Surge Compressor Cover with 3” Inlet, this turbocharger will put down some serious numbers. Our number one goal for this turbocharger was boost response, and we’ve achieved this! On a Subaru EJ25 engine we have achieved 25psi of boost before 3500rpm! The AVO GTX55 utilizes a Garrett GTX ball-bearing CHRA, which is water-cooled and oil-lubricated for maximum reliability. Our turbochargers have been designed to perform in the harshest conditions possible, and have been tested in them as well. AVO products are not designed to be as reliable as OEM – they are designed to be much better than OEM. 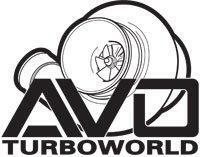 Our new Stainless Steel exhaust housings ensure your turbo will go the distance. This turbocharger is designed to fit the 2008+ Impreza STI. It can be retrofitted to fit the 2001~2007 Impreza WRX and STI models plus other models when combined with a front mount intercooler system. The AVO GTX55 comes with all the necessary fittings, mounting spacer kit and a full 3” Silicone Inlet Pipe Kit. As the figures demonstrate, this is a serious turbo that ramps up quite quickly despite its size, thanks to AVO’s engineering and the ball-bearing design. On the street it is seriously quick, and will surprise many a supercar! This dyno chart is from the AVO GTX55 on the AVO STI, fitted with the AVO FMIC, an AVO TBE, intake, TGV deletes, fuel pump and injectors. That is 353kW at the wheels, and 705NM of torque! As you can see from the chart, we made 473whp and 520ft/lbs of torque on our STI!